The EISA programme in Mozambique in 2009 was dominated by the electoral process that led to the presidential, legislative and provincial elections held on 28 October 28 2009. Therefore, most activities implemented throughout the year - training, technical assistance, debates, and media events - were related to that process. Some programme activities that were implemented included the promotion of dialogue between civil society and elected bodies. After a long delay in starting the implementation of this activity, EISA signed a Memorandum of Understanding with the Mozambican Association for the Development of Democracy (AMODE). Contacts were made with a wide range of civil society organisations and with Parliamentary committees to set up a calendar for joint roundtables both in Maputo and in the Provinces. Five roundtables between civil society organisations and parliamentary committees have taken place, all outside Maputo. The topics covered by the roundtables include: the Bill on the Protection of People Living with HIV/AIDS; the Bill on Domestic Violence; the oversight by parliament of the use of the Mt 7 million district fund, allocated by central government to all districts to promote food production, employment and income-generating activities; and the oversight by parliament of the State budget expenditures. In the last quarter of the year, this activity did not register progress, as most members of Parliament were involved in the electoral campaign for municipal elections. The Parliament-Civil Society Partnership provided an opportunity for increased dialogue and mutual understanding between civil society and parliament on key social issues through the conduct of 5 roundtables between civil society and parliament. The main challenge faced by EISA Mozambique in 2007 was the implementation of the Civil Society-Parliament Partnership activity. Initially, the Mozambican Debt Group, a coalition of civil society organisations, was selected as EISA's implementing partner. After lengthy negotiations, a provisional memorandum of understanding and plan of action was agreed upon, but this has not yet been implemented. Towards the end of 2007, a new implementing partner, the Mozambican Association for Democracy (AMODE) was identified, and a memorandum of understanding and action plan will soon be signed. Speedy implementation is expected to start in March 2008. The aim was to foster a culture of accountability of elected bodies towards citizens through increased dialogue between parliamentary committees and Mozambican CSOs. 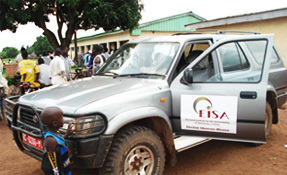 In 2006 EISA took steps to identify local CSOs which would engage selected committees on key issues and policies, and to which EISA would provide technical assistance for the development of position papers, policy analysis and specialised discussions. After several consultations, the Mozambican Debt Group (GMD), an NGO focused on poverty alleviation, pro-poor social spending and social policy advocacy, agreed to collaborate with EISA on the implementation of this activity. However, due to time constraints on their part, the activity was not initiated in 2006. In 2005 the goal to enhance the partnership between civil society and Parliament in order to strengthen a culture of accountability of elected bodies was adopted for EISA Mozambique as the second of three others.